The greatest weapon they had was temptation. Flaunting our most coveted desires- made our mouths water. They dared us, it was all laid out for the audacious to come ahead and claim. But it was all abstract and insidious - nothing tangible to hold and say, “You lured me in with this. You cheat, you flagrant fiend.” Luring the prey into the trap was nothing new… effortless and subtle. Set the trap, lay the cheese and wait for us to give in to instinct - to explore what we did not know. Tempt us to dare - to harbour in the mind a single thought of more and we were caught. Don't change; don't reach higher - the mantra to an ignorant, blissful life. For they were always on guard, vigilant to shoot down whoever desired the forbidden fruit. No second chance… swift, merciless retribution. The greatest aspiration we had was to fly. We knew it and they knew it. The ostentatious show of birds in the sky they put up for us was meant to be seen through. But that wasn't enough. They were drunk on power and their skills had been honed with time. They knew that there was a thing that hurt more than not wanting and even the retribution. Temptation. The middle ground where we were always tormented. To fly or to turn back - the uncertainty was killing us. The fear of defying and the urge to defy. A delicate balance never at equilibrium. And the moment the balance favoured them, they had us. The greatest temptation they set before us was the wings. Delicate and non-pretentious; beautiful and intricately laden with possibilities. They pretended the wings were for show, archaic beauties to be only looked at and marvelled. They tormented us, daring us. We wanted to flap them, take them to their limits. From our backs they whispered promises of the sky, sullying our minds with blasphemous thoughts; thoughts of the unfathomable and the intangible. They promised us the narcotic of disobedience. And we dreamt of the rush as air would hit our face and we would go up, up, up and then suddenly stall, and the feeling of hurtling down as if through an endless abyss only to regain hold just before the fall. Yes we dreamt and for that we suffered. The wings were two edged knives. The greatest gift we had was that of defiance. Something would snap all of a sudden and the temerity would be gone. We would stand on the precipice and the mysterious clairvoyance of the wings would urge us on. The jump promised a new beginning. Many would fall; the promises were sometimes fatal. The wrathful arrows of vengeance would rain down and wounded figures with bleeding wings would hurtle through the sky. The aftermath was deadlier. Wings were mutilated and we would be bound by chains. The primeval fate of Prometheus was ours. Were we divine for trying? The greatest power we had was of tenacity. 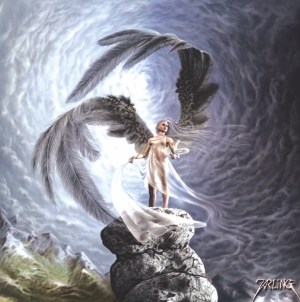 As feathers fell from the sky and men became Sisyphus, the wings grew in strength. Their promises grew wilder and the day when the boulder to be pushed up the slope would disappear seemed at hand. The horizon seemed a limitless expanse and the chains were just a transitory phase. And as thoughts of further defiance blossomed, the patterns on the wings seemed to revitalise. The temptation was addictive, like the sting of poking a cut. We wanted to go higher than the time we first fell. And we waited, the day when we would fly again. One of the characters from the HBO adaptation of the first book, Game of Thrones, said that. And it is just as appropriate with regard to the fourth book as it was with the first. In George RR Martin's fourth offering, we find the world of Westeros reeling from war. The regions affected are at the first stages of a man-made famine and with autumn turning into the first touches of winter, the hopes of another harvest before the cold and the ice arrive is dwindling. People are worried about the future and about how they will survive the long years of winter ahead. 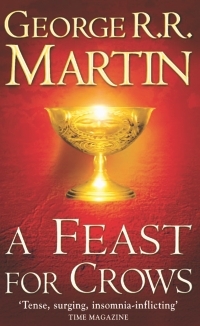 A Feast for Crows was originally called 'A Dance with Dragons' and intended to be a humongous volume, set five years after the events of A Storm of Swords. However, Martin came across quite a few difficulties while writing it, mostly to do with continuity, clarity and coherence. He didn't really want to write a story that was told through flashbacks after putting so much effort into it. Rather than write another cinderblock's worth of weight in words (which was another issue, since the publishers had a difficult time accommodating A Storm of Swords), he decided to split the story up into two books. Both books would follow a parallel timeline and both books would contain a different cast of characters focusing on a different area of the world. Thus A Feast for Crows came into being. On paper the idea sounds refreshing, you get to see the world of ASOIAF being fleshed out in more ways that before through the eyes of side characters. Unfortunately, the truth was slightly grittier than that (ironic since Martin is credited with giving fantasy the 'gritty reboot'). The book took five long years to come out, frustrating fans and raising expectations to monumental heights. This book is largely limited to the lands of Westeros sans the North. We see Cersei, the Queen Regent, trying to rule the land through her son while becoming increasingly paranoid and desperate to hold on to power. We see her brother Jaime trying to deal with his new disability. We see how he came to be called the Kingslayer and how he has dealt with the dishonourable image the world has painted him in. On another part of the continent, we see Brienne searching for Sansa Stark. And we do see Sansa as well, living high up in the Eyrie, learning to run a castle and more importantly, learning to play the game of intrigue from Petyr Littlefinger. Down south, we see Doran Martell, the ruler of all of Dorne, still refusing to truly take part in the war despite pressure from home and abroad. Further west we see the developments in the Iron Islands through the eyes of Aeron 'Damphair' Greyjoy. To the east, in the city of Bravoos, we see Arya Stark and her involvement with the 'Faceless Men'. In the same region there is Samwell Tarly, a sworn brother of the Night's Watch making his way to Oldtown to become a master. There are those who say that the fourth book is the weakest in the A Song of Ice and Fire series. They argue that the story didn't really move forward, that George RR Martin, like Robert Jordan before him, created a world that was too big and complicated for him to do justice to it. Mostly though, a lot of the readers complained about the book seemingly focusing on side characters and not the ones they were looking forward to reading (e.g Jon, Tyrion, Bran). This reviewer though disagrees. A Feast for Crows lacks the constants gut-punches the first three books had and it lacks the explosive oomph of the third book especially, but the crucial thing it does have makes it just as good as the rest. Good story. Yes, just that. The story might not move forward in the conventional sense, but the story is moving. Martin once said in an interview that he really does try to ignore the side characters, the faceless herd that support the main cast of the story but he can't because to him, they're just as human with just as compelling stories. In a lot of other fantasy books, the world is only fleshed out to the point where it serves the story. In ASOIAF the world is the story. It is not the wars or characters' personal journey that is important here, but the development of the world as a whole. A Feast for Crows was the bridge A Song of Ice and Fire needed to make the story that much more believable and diverse. And if you've made it as far as A Storm of Swords, don't be disheartened by the prospect of not seeing your favourite characters. This book is just as good, but different.